All operating program and control modes may be set or adjusted-handsoff-during surgery via the foot control. This includes speed control, coolant flow, and direction of rotation. 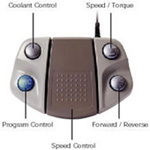 The foot control has been designed to accidental activation of the micromotor system. The robust and durable foot control has been produced with a non-slip under surface to prevent sliding on special floor coatings in theatres. It will remain in a stable location during operating procedures. The wide variable speed range of 200-40,000 min-1 provides the flexibility for all surgical procedures. As an example, by using a 20:1 speed reduction handpiece attachment the speed range is then adjusted to 10-2,000 rpm and torque is maximized to 50 N・cm. The NSK Surgic XT micromotor produces the lowest noise and vibration in this class. Compact and virtually vibration free, the NSK Surgic XT is designed to fit comfortably to the human form for prolonged periods.The size and comfort of the brushless micromotor is without compromise to the torque and speed output. Durability is assured even with repeated autoclaving. 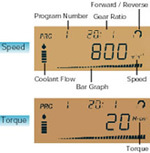 the running speed or torque will be shown as a percentage of the maximum speed or torque setting. Coolant flow volume may be controlled to any of 5 settings, or stopped. During surgery, coolant flow can be adjusted, or stopped, via the foot pedal. NSK Surgic XT memorizes 8 complete program sets including speed, torque, coolant flow, and rotation direction, according to the gear ratio of the handpiece to be used. Program settings continue to be stored even when supply power is turned off. Each program setting can be rewritten even when the unit is in use. New programs are memorized simply by pressing the Memory key. A simple Quick Connect cable system allows immediate interchange of the cable and micromotor during treatment. Every handpiece attachment has individual resistance characteristics against micromotor driven rotation. To achieve the absolutely precise rotary cutting speed and torque demanded for oral surgical procedures, NSK Surgic XT automatically calibrates the micromotor to the resistance of each individual handpiece when attached to the micromotor.